If you've recently moved into your first small apartment in the city, you may be overwhelmed by the cramped nature of the space. Unless you're making the big bucks, you're probably going to have to settle for a small place as your first home, and your bathroom is going to be a particularly tricky space to decorate. According to Better Homes and Gardens, if you have a tiny space to work with, go big and bold with a few everyday bathroom accents. Instead of using a tiny mirror, make a big statement by utilizing a mirror that takes up a majority of the space above your bathroom vanity. Not only will this provide a jaw-dropping accent, but it will visually increase the size of the space and make better use of natural light. Lighting is another important consideration, so go with a few soft fixtures above your bathroom vanity to provide warm lighting in the mornings and evenings. With a wide variety of fixtures available, you can find something that will match any aesthetic. Urban decorating is certainly a challenge, but these tips will help you set your space apart from the rest. 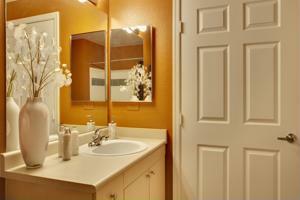 What advice do you have for those who are decorating an apartment bathroom?